Every second year, Mountain Wilderness Switzerland is awarding a prize for attainments in wilderness conservation and for a wilderness-like experience by fair means in the mountains. This year, in 2013, it will be given to short videos related to the tension between sites where wilderness can be experienced and sites where wilderness is disturbed. At a specific date in autumn/winter 2013 Mountain Wilderness Switzerland will organise a public event where the videos will be presented. 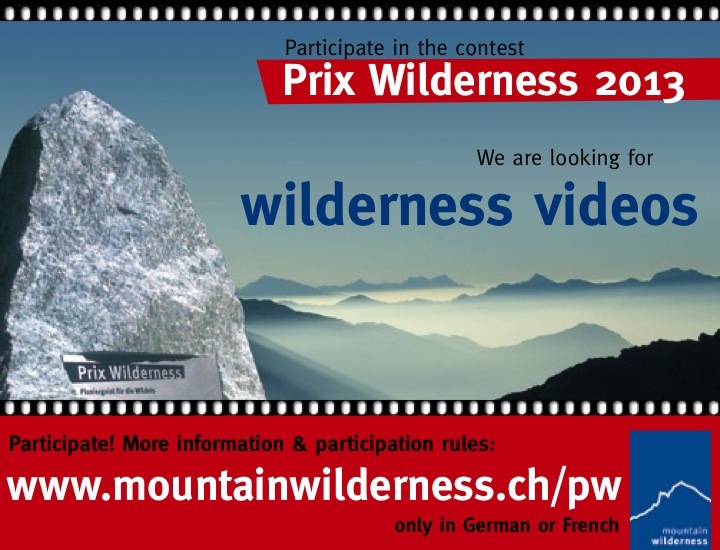 The best videos will be awarded with different prizes and the public should get a better overview about “wilderness”. The contest is not only Switzerland specific. Videos from all other countries within the Alps are desired. The information is available in German or French on www.mountainwilderness.ch/pw.